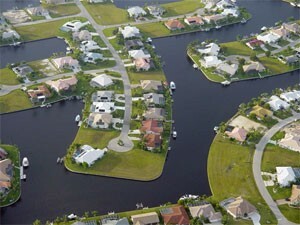 Punta Gorda includes Punta Gorda Isles, with its network of canals. The county seat of Charlotte County is Punta Gorda, a charming waterfront community with State Historic District status. With a population of only about 13,000 in its 14.1 square miles of land, Punta Gorda has the charm of small-town living, with the amenities of Port Charlotte, Fort Myers, and Sarasota only a short drive away. The name “Punta Gorda” means “fat point” in Spanish, named thusly by the early Spanish explorers who noted the wide point of land that juts out into Charlotte Harbor. The historic district of downtown Punta Gorda, a vital and growing area, offers a quaint “Old Florida” feel, with its cobblestone streets and towering shade trees. The canals of Punta Gorda Isles and Burnt Store Isles bring waterfront living to almost every resident of the neighborhood, with access to Charlotte Harbor and on out to the Gulf of Mexico. Other communities offer a wide selection of homes and lifestyles, including Deep Creek Park, Prairie Creek Park, and Seminole Lakes. Most of the subdivisions are situated either on networks of canals that provide easy access to the Harbor, or on or near golf courses. 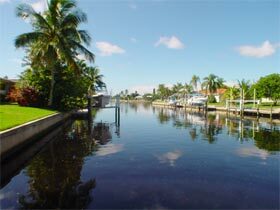 The canals of Punta Gorda Isles in Punta Gorda offer access to the harbor from nearly every home in PGI. In Punta Gorda, historic preservation is a priority. Punta Gorda obtained State Historic District status to ensure that the old-time charm of the city is kept intact. Restored old wooden homes and Spanish-style homes with broad front verandahs are found throughout the tree-lined streets of the historic district. The Fishermen’s Village complex on the Charlotte Harbor waterfront offers a marina, boutique-style shopping, and waterfront dining, and just across the Peace River is the thriving community of Port Charlotte, with its large enclosed Port Charlotte Town Center shopping mall, movie theaters and more. The Charlotte County Airport outside Punta Gorda is the home of the South Florida International Air Show every spring. In the more rural areas of Charlotte County outside Punta Gorda are many citrus farms and cattle ranches, along with nature preserves where wildlife spotting and swamp buggy tours are favorites of nature lovers. Hunters enjoy going after game such as deer, wild boar, quail, dove and duck.